Choosing a favourite between Neil Gaiman’s books is akin to choosing a favourite snowflake. They are all different, and equally beautiful. Each book has its own distinctive voice, and each has something to say about the reality we live in and what it means to be human. 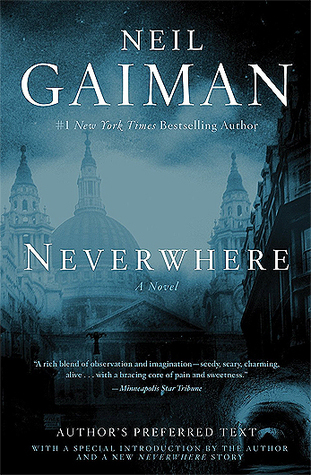 But one of Gaiman’s stories that is very dear to me is Neverwhere. It exists in many formats: a television series; a novel; a comic book; a stage play; an all-star radio adaptation; an Author’s Preferred Text edition; and an audiobook. Every version is brilliant, but my favourite is the audiobook of the Author’s Preferred Text edition—the equivalent of the director’s cut in the literary world—read by the author. In Neverwhere, Richard Mayhew is with his fiancée, Jessica, on their way to have dinner with her boss when a door opens and a girl in bulky clothes stumbles into the street and collapses. While Jessica simply walks over the girl as if she were invisible, Richard stops to help her. This act of kindness changes his life forever. The girl’s name is Door and she comes from a London that exists below the one Richard knows. It is a London where magic and darkness are very real and so are angels and monsters. The inhabitants of London Below are those that have fallen through the cracks in society, and are thus invisible to the people of London Above. When Richard helps Door return safely to London Below, he inadvertently becomes part of London Below and invisible to the people around him. Taxis won’t stop to pick him up, people that have known him for years act like he doesn’t exist anymore, and the only people that see him are those the rest of society also seems to not see, those without a home. Richard then begins a dangerous journey into London Below to find his way back to his life in London Above. Neverwhere is an excellent example of how fantasy can sometimes expose reality more deeply than other genres. Neverwhere explores the theme of homelessness and how people can fall through the cracks and become invisible simply by being different. It invites us to look at our world with critical lenses, and makes it impossible to walk by human suffering without acknowledging it. No person should be invisible.